Bring fun and excite­ment into the life of a friend with an intro­duc­tion to danc­ing at Arthur Murray’s! It’s the gift that truly keeps on giv­ing as he or she meets new peo­ple… makes new friends… and gets involved in a year ’round whirl of dance par­ties and good times. This gift cer­tifi­cate is good for 2 Private Lessons, 2 Group Lessons and 2 Practice Sessions for $290.00. 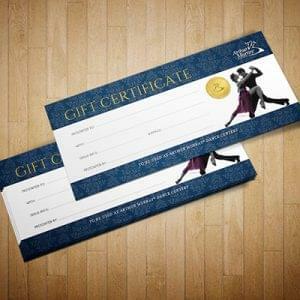 Once you have purchased your gift certificate we will email the download link and your transaction ID to you. Please make sure that you write your transaction ID on the printed certificate before redemption or we will not be able to process it.